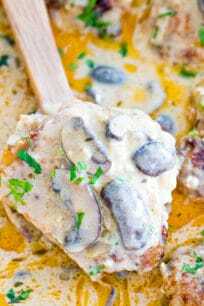 Creamy Chicken and Mushroom Casserole is incredibly delicious, made with lots of mushrooms and tender chicken thighs. This casserole will make a perfect family dinner that everyone will love. We like making easy and delicious Casseroles, because they are tasty, can feed a larger crowd, and usually make enough leftovers. Occasionally, we even prepare a few ahead of time and freeze them to have dinner readily available for crazy weeknights. 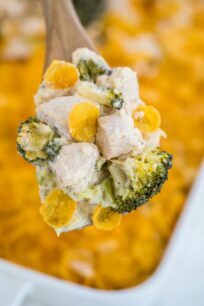 We often make this Cheesy Crack Chicken Casserole, White Pizza Casserole and obviously Mac and Cheese Casserole. Recipes with chicken and mushroom are among our favorites, and this one is a great combination of both. 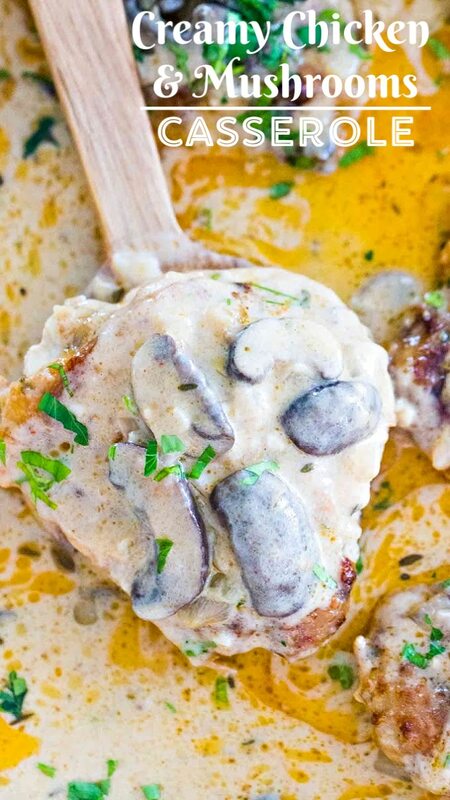 This Creamy Chicken and Mushroom Casserole is very easy to make in the oven. With little time and effort, you will have a quick and delicious meal to serve. The dish is creamy, flavorful, and can feed a larger crowd. 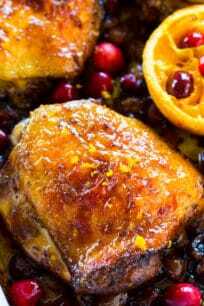 For this recipe, we used chicken thighs, because they give a richer and a more profound flavor. However, chicken breasts works perfectly fine as well. First, heat about 3 tablespoons of olive oil in a frying pan over medium-high heat. Once hot, add chicken thighs to the hot oil. Cook on both sides till golden. Remove the chicken thighs from the pan and set aside on a plate, cover with foil. Later you will transfer the chicken thighs to the casserole baking dish. Add the onion and garlic, cook a few minutes. Add mushrooms and dried herbs to the pan and cook for five minutes, or until softened. Spread mixture on the bottom of the casserole dish. Next, melt 2 tablespoons of butter in the pan, add the flour and whisk it until lightly golden (1-2 minutes) and fully combined. Add 1 1/2 cups chicken broth and whisk until smooth. Add 1 cup cream, whisk until smooth and bring to a simmer. Season with salt and pepper to taste. Stir in Parmesan cheese until fully melted. Pour sauce over the mushroom mixture in the baking dish. Add chicken on top, skin side up. Then, cover with foil. After that, transfer the dish into the oven, and bake the casserole for 30-40 minutes at 375˚F. Before you remove it from the oven, discard foil cover and broil for a few minutes, until chicken is golden-brown. We used chicken thighs instead of chicken breast. This gives the casserole extra richness and flavor. Also, chicken thighs are far more tender than chicken breast. Use quality chicken broth. For store-bought version, I go with Organic low-sodium broth. In addition, I added Parmesan cheese to this dish, to have a richer and creamier sauce. You can make the Creamy Chicken and Mushroom Casserole ahead, then cool, cover and refrigerate for a day. When ready to eat, reheat it in the oven (covered) at 350F for approximately 20-25 minutes. How to serve Creamy Chicken and Mushroom Casserole? This dish can be served as is. Additionally, it goes well with mashed potatoes, mashed cauliflower, rice, noodles or just with bread. Bake, frozen and covered with foil, at 350°F, for 1 hour. Or, thaw overnight in the fridge and reheat in the oven. 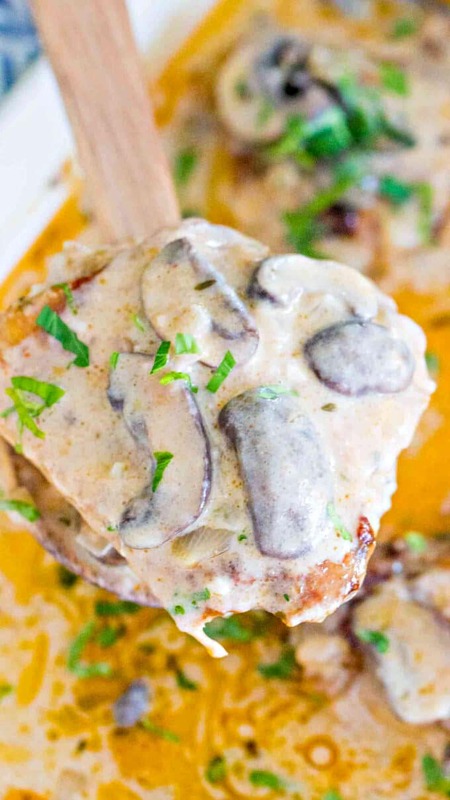 Creamy Chicken and Mushroom Casserole is incredibly delicious, made with lots of mushrooms and tender chicken thighs. Arrange oven rack in the middle of the oven. Very lightly grease a 9x13 inches casserole/baking dish and set aside. Heat about 3 tablespoons of olive oil in a frying pan or cast iron skillet over medium-high heat. Once hot, add chicken thighs skin side down into the hot oil. Cook of both sides for about 1-2 minutes, until golden-brown. Remove the chicken thighs from the skillet and set aside on a plate, cover with foil. Later you will transfer the chicken thighs to the casserole baking dish. If needed add more oil to the pan and add the diced onion, cook for 1-2 minutes, stirring occasionally. Add garlic and sauté another 1-2 minutes. Add garlic and cook for another minute, stirring. Add sliced mushrooms, thyme, dried parsley, paprika, salt and pepper to the pan, stir and cook for about five minutes, or until softened. Spread mushroom mixture on the bottom of the casserole dish. Return pan to the stove over medium heat. Next, melt 2 tablespoons of butter in the same pan over medium heat. Add the flour and whisk it until lightly golden and fully combined, about 1-2 minutes. Slowly and still whisking, add 1 1/2 cups chicken broth, whisk until smooth. Add 1 cup of heavy whipping cream, you can use light cream or half and half too Whisk until smooth and bring to a simmer for about 2 minutes. Season with salt and pepper to taste. Stir in the grated Parmesan cheese until fully combined and the cheese is melted. Pour sauce over the mushroom mixture in the baking dish. If preferred, sprinkle some extra parmesan cheese. Add chicken on top, skin side up. Then, cover with foil. Transfer the dish into the oven, and bake the casserole covered for 30-40 minutes, until the chicken is tender and cooked through. Before you remove it from the oven, discard foil cover and broil for a few minutes, until chicken is golden. Warm, hearty casseroles are my go to meal choice during the fall and winter months. This one looks insanely delicious! I feel like this casserole would be super nice and comforting right about now. I definitely like that it can be prepared ahead of time. 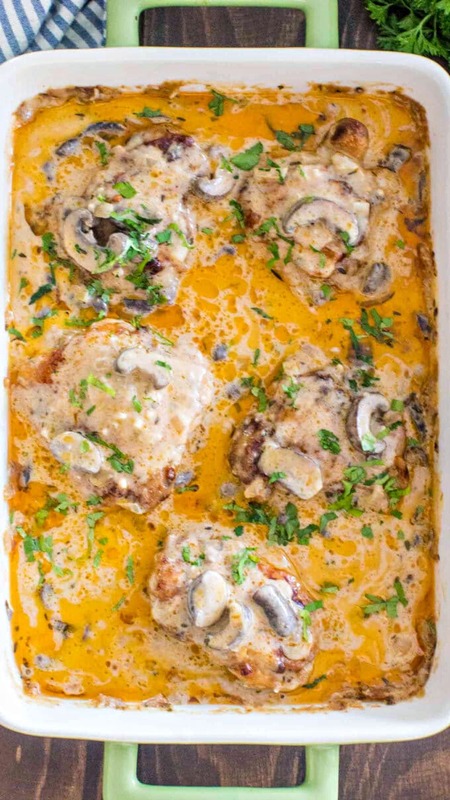 This creamy chicken and mushroom casserole looks like a delicious dinner idea for me to try out with the family. Thank you, I’m going to try it this week! this looks like the perfect Fall dinner! I am all about creamy and yummy casseroles these days! Bring on the comfort foods of the cold weather season. That looks so yummy! And you are so right about using chicken thighs. It is the best choice for depth of flavor in a dish like this. 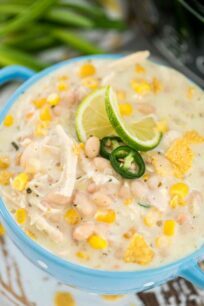 This meal is perfect for those cool fall nights!! I’m not really a fan of mushrooms, but this still looks good. I’d have to make it without them though. Still sounds really delicious! This is great! I love boneless chicken thighs and I’m always looking for new ways to make them. I do something similar with thin pork chops that my family loves, so I bet they’ll love this one, too. I love eating chicken a lot but never tried to make this kind of delicious recipe. I would love to try this and I am sure my kids will love it. This looks really creamy! Can’t wait to give this a try! mmm..such a fantastic casserole! Perfect for fall!! This is something I want ready tonight for dinner…looks so comforting! This looks so good! I wish everyone in my home liked mushrooms. I want to make good food like this! This is comfort food for me. I love all of these things together in one dish. This is my kind of comfort food! I cannot wait to dive into this! Now this is a one dish meal my husband and I would enjoy. If kids were eating I would to forget the mushrooms. Darn kids. Love baking a casserole and then having the leftovers the day over for lunch. I also use boneless, skinless chicken thighs in my recipes as well. They don’t dry out like chicken breasts do. That looks so good! I love the idea of using the leftovers to make a whole new meal! What a great way to save money and still be able to eat great all week. This recipe looks so savory. It would be perfect to make for my family for dinner tonight. This yummy chicken casserole is the perfect comfort food recipe for these cold-weather months. Your images make me want to reach through my screen with a fork to grab a bite! This looks incredible! I just love a good casserole. It’s been a while since I made one, so I should prepare this for dinner one night. OK now this looks absolutely delicious – I could definitely tuck into this for dinner. I wonder if I have the ingredients needed around the place! I love chicken and creamy mushroom together. This is such a great comfort food recipe. You had me at mushrooms. This dish looks super tasty and I have all the ingredients army house-perfect! You had me at “mushroom casserole”–two of my favorite words together! 🙂 Seriously though, everything about this sounds incredible. Pinning immediately–and making it soon! Oh, I make something similar to this and my kids love it. I need to try this version sometime. This looks so great. I love making casseroles. My mom would always crack open a jar of canned of… my sister and I always shudder. I love making the sauces and creams from scratch. I can’t wait to try this. Yum! I love making casseroles for my family, it is an easy meal and everyone loves them. I am really wanting to give this one a try, thanks for sharing it! Why I need to see this at this point in time. I am hungry now and I see this deliciously made creamy chicken caserrole. Oh myyy, such a torture to me while drooling over the pictures. I need to try making this the soonest. Awww, comfort food and mushrooms in every bite is my kind of dinner. Thanks for the recipe and great photos – now I’m starving. Yum! Gotta love a good casserole. So warm and comforting this season too! Pinned and planning to make soon. Thinking it would be good to make this with turkey instead of chicken; a good way to use left overs from Thanksgiving. I made this dish last night, and it came out delicious, very rich in flavor and meat is just perfect!! !